After reading through LXF, I tried loading openSuse 11.1 with the failsafe settings and it worked in VirtualBox. So I’ll now be reviewing openSuse 11.1. Here’s the screen as it booted up. and after it loads up, it gives a nice explanatory screen. 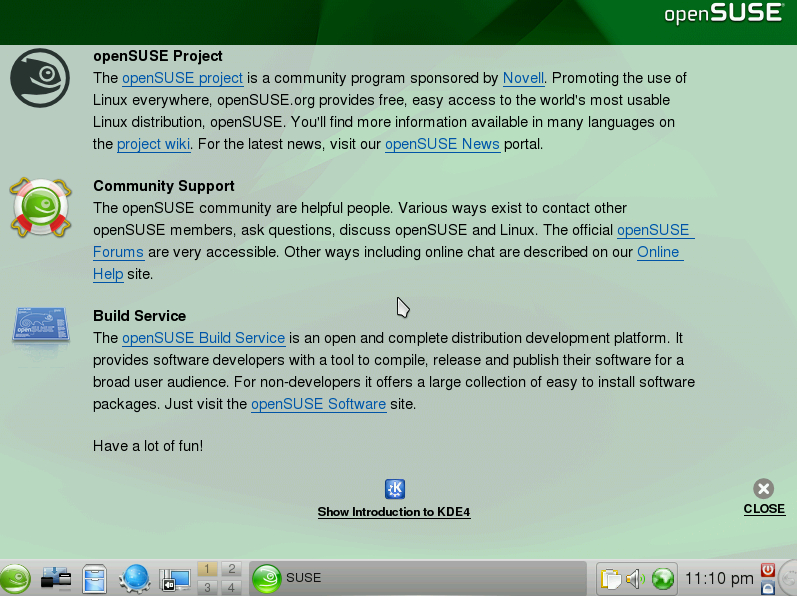 So I last looked at openSuse 11.0 in Aug 2008. I’m not sure exactly how much has changed from 11.o to 11.1. I re-read my old review to get some perspective on what I said last time. Once I’ve gone through a distro at least once, I don’t see a point in repeating myself. Rather I look at how the distro has evolved since last time. Follow that link a few sentences back to see what I originally said about openSuse. As with Linux Mint 6, this time I’ll be evaluating the distro installation process – since I didn’t get to do that before as well as the program installation process. openSuse was listed in my Fedora 10 review as the distro with which to see how awesome KDE 4.2 is – so I’ll be testing that as well. I clicked on “Show Introduction to KDE 4” and it pretty much covers any possible issue people might have in changing from KDE 3.x. Now the openSuse team has made an interesting decision. I praised them in openSuse 11.0 for figuring out how to have desktop icons when everyone was complaining about plasma’s virtual folders. But for openSuse 11.1, it has the folder view by default. It’s not really a big deal because the intro to KDE 4 that I clicked on before explained how to get the desktop to behave like a normal destkop. Of course, that assumes people read. The desktop is nice. The theme looks good. The only other major difference is that they now have 4 virtual desktkops by default. Alright, let’s see what the openSuse installation process is like. Yast is used. So this really is their all-in-one tool. I’m also warned that <1 GB might not be enough for a live install. Those are some pretty beefy requirements for Linux. First up is a license agreement. They caught some flack over a previous one and changed it. I’m not sure what all the fuss was really about. The installer helpfully not only tells you what it’s doing, but what it’s already done. Installation took a standard approximately 30 minutes. (I wasn’t around to see exactly how long it took, but definitely less than 1 hr) Then it ran some configuration utility. Clicking on “My Computer” launches sysinfo:// and you get copious amounts of info. Performance was a bit more sluggish than Linux Mint 6. The usual programs were included such as Open Office.org 3.0, Kopete, Konversation, Amarok, and so on. They seem to have chosen KDE programs everywhere except office. But, as we know, until KOffice 2.0 comes out of beta and perhaps proves itself vs Open Office.org – it’s not really a contest. While trying to figure out how to install more software, I came across the repositories program so I clicked on it. They all seemed to be checked. I got sick of searching for the installation program, so I typed “install” in the menu. I still think this program is insanely ugly. 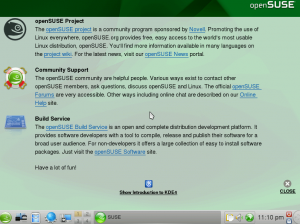 It just feels so Windows 98 and out of place when the rest of openSuse 11.1 looks very nice – verging on beautiful. One good thing about it is that all those tabs in the bottom half of the screen have a lot of info. So, even though the GUI is ugly as heck, it certainly wins vs Fedora in terms of information and organization of said info. It loses, however, vs Linux Mint 6 and mintInstall with its ratings and screenshots. 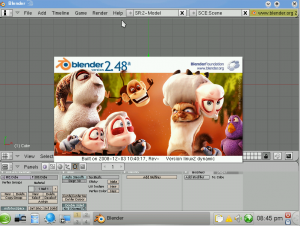 So I do my usual install of Blender. They have 2.48a. So they are just as up-to-date as Fedora! (Makes sense since Fedora and openSuse are rivals in the same way as The Yankees and The Red Sox) So this takes a few minutes. Time to look a bit at KDE 4.2. Overall, openSuse continues to have a solid KDE release. I didn’t see anything outstanding or that much more amazing compared to openSuse 11.0. They put out such a good KDE 4.0 implementation that there isn’t much to improve upon. So how was openSuse 11.1? It was a little hard to find some of the configuration utilities, but you could always use the search bar in the K menu, so it wasn’t too bad. There’s no doubt in my mind that openSuse seems like a nice, solid distro. It just feels very tight and professional. It also appears to be as caught up on the new versions of programs as Fedora. So, ever since last August, I would rate the pop distros as follows. For a new Gnu/Linux user – Linux Mint 6, Ubuntu, Mandriva, openSuse, Fedora. I think that Mandriva has put that last little bit of spit and polish on their latest release to edge ahead of openSuse. Linux Mint 6 is, for the new user, the epitome of elegant and easy-to-use Linux. 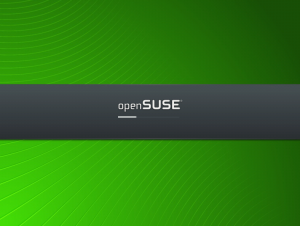 But if we’re talking about experienced users – then openSuse takes the top honors. Over the last two releases it has been solid and well-polished. While Fedora 10 is pretty awesome, Fedora 9 was a mess. And Ubuntu and Mandriva don’t seem to cut it for me as an experienced user. They’re good distros, but feel too n00bish. So, openSuse is a good distro to check out. Their release engineers are doing a great job. As with last time, the only cause for hesitance is their pact with Microsoft as that may be a deal-breaker for some users out there. They’ve also done some other stuff that really bugs some people in the community such as working on composite extensions to X.org without telling anyone, “forking” Open Office.org, and supporting/housing the Mono and Moonlight teams. For me, personally, only Moonlight worries me from the point of view of helping MS overtake Flash and then what if Microsoft stops cooperating? Also, the doing all the composite stuff behind the scenes was a little more cathedral than bazaar. But the rest is pretty minor to me. To some others, they are irreconcilable differences and to others still, a reason to boycott Novell. If you call yourself a supporter of open source rather than free software, you’ll probably find a lot to like in openSuse. That is the best not Ubuntu that is easy to use.. I agree with the above poster, Parsix Linux is a great distro that just works. Good for newbies and command line gurus alike. 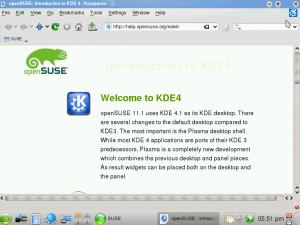 OpenSuse 11.1 doesn’t include KDE 4.2 but 4.1.3 (but with some pieces of 4.2). So it’s sure that it’s not so breathtaking compared to 4.0 in OpenSuse 11.0 (which included some pieces of KDE 4.1). Well, that certainly explains it. It’s pretty clear that the default KDE is 4.1.3. 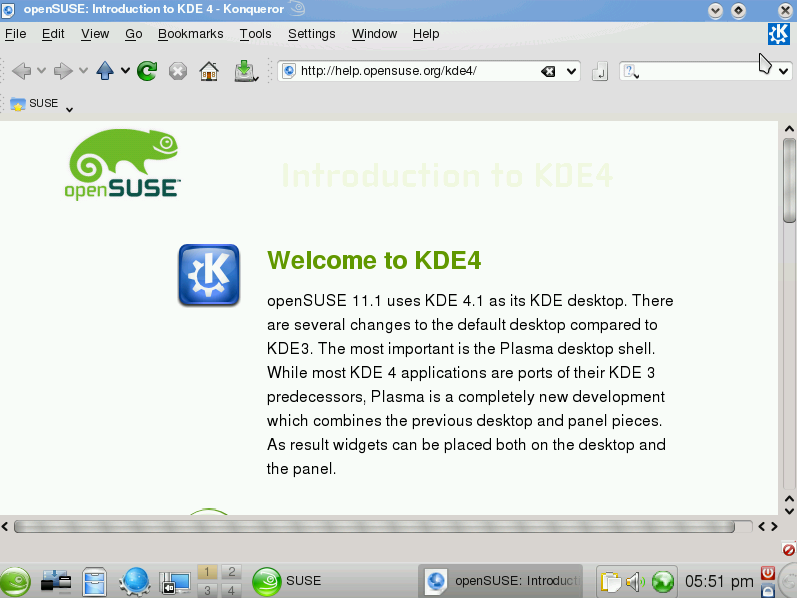 If you look at your screenshot of the ‘Introduction to KDE’, it states right there, ‘openSUSE 11.1 uses KDE 4.1 as its KDE desktop’. 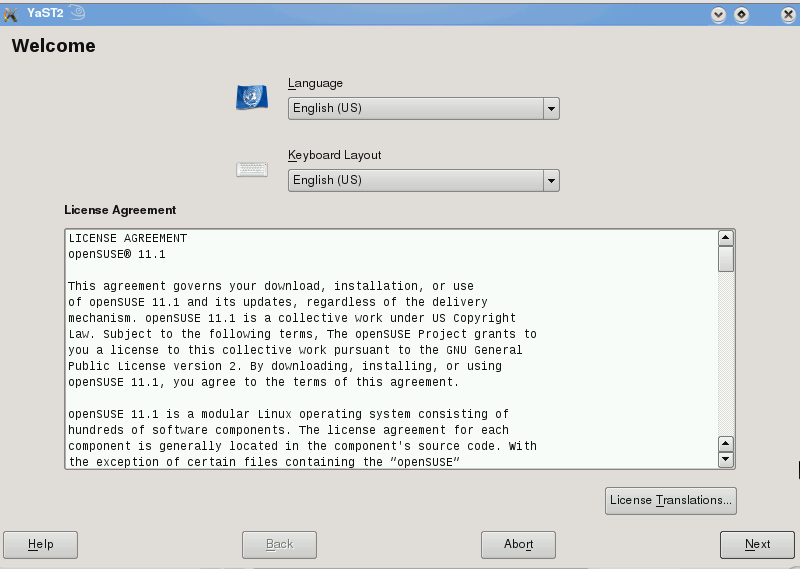 Users can optionally add the KDE factory repository to update to KDE 4.2 (officially unsupported). I’ve done it myself and, after overcoming some initial bugginess with Plasma following the upgrade, it’s a massive improvement over 4.1. 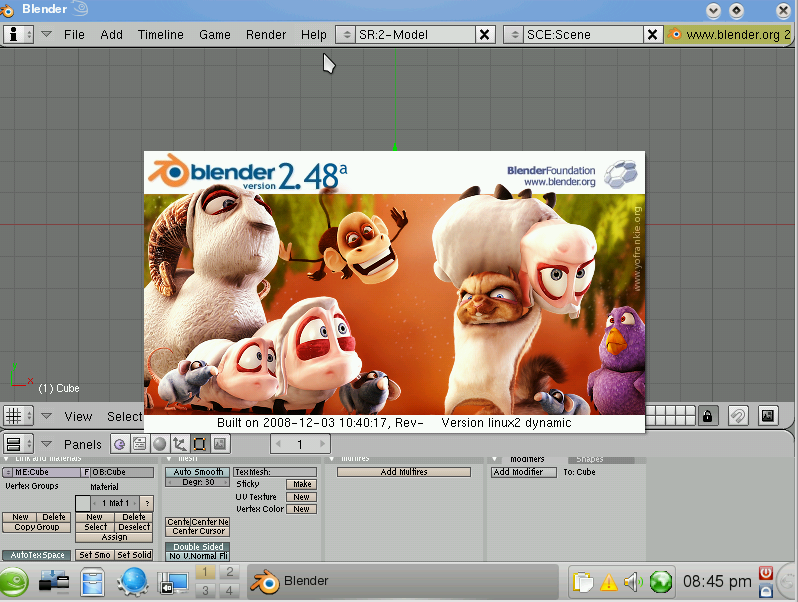 It provides different view types for the desktop, including not only the Folder View but a standard desktop that behaves just like KDE 3, for those who can abide nothing else. Since you installed from the desktop rather than directly booting off the CD, your installation process would have been rather different (and by the looks of things, less beautiful). On a standard install there is now a modified partitioner that provides a more graphical and detailed view. Software selection can go as deep as you like by selecting patterns or individual packages. Also, the license agreement is no longer the EULA style of old and there is now a clear separation of OSS from non-OSS software on the supplied media, to facilitate problems with distribution. I don’t know how I missed that. Seriously, sometimes my brain doesn’t register what’s right before my eyes. I’ve tried the OpenSuse 11.1 and it does seem to be somewhat sluggish but a very nice distro. Another nice review. One thing I do disagree with you on is the statement regarding a distro being too noobish for an experienced user. That statement is relative to what a person wants to do with his os. I am an experienced user andI run Ubuntu for the reason that I do a lot of work with my computer and I don’t really have time to do a lot of playing around or fixing things. OpenSuse is somewhat of a different animal but if a person wants to spend a little time with it and learn the in’s and out’s of the system than it would make a good distro for anyone. You are correct in that LinuxMint 6 is still the best distro for a person being introduced to Linux for the first time. Looking forward to your next review. You make a good point on the newbie aspect. The next review should be sometime this week. 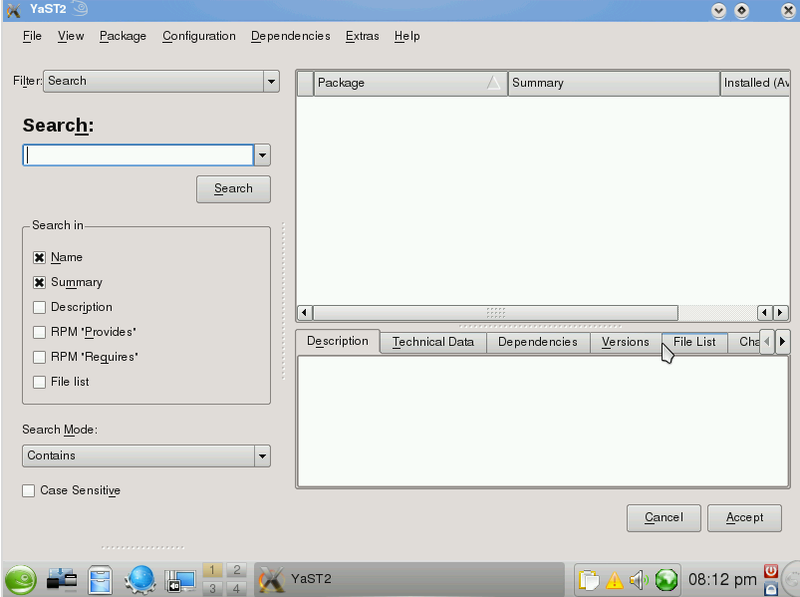 YaST2 or Software Management looks a bit ugly because it is still based on qt3. Infact any kde3 app (built on qt3) running under kde4 looks ugly. The next version of openSUSE will port YaST2 to qt4, so it’ll be having native kde4 oxygen skin. you can install any of the above without internet, they include all the dependencies, just unzip the both files into a folder named MMP2009 and create a repository from that folder as a simple rpm folder in yast, then make a search in the yast installer with the name of the program and check it to install it, this is very important if you don`t have internet at home, and besides, by default Open Suse doesn`t include several codecs due to license matters. Thank you for your review of OpenSUSE 11.1. I’ve been using OpenSUSE 11.1 with KDE 4.2 for 2 months and I really like it. I’ve been putting together Myth box and have looked at all the distros, (Knoppix, Mandrivak, Ubuntu (appears to be loved by most), Gentoo, eg: I settled on openSuSe because of its ease of use and its logic. Kde is easier and has more apps and options than Gnome. I have in my box right now is: Antec case, Asus Intel MB 915PL, 1024GiB paired Memory, 3Ghz Intel CPU. I have a Hauppauge 150, 1800 dual NTSC/ATSC. I am using a nVidia 7600GS, which has a HDMI, S-video, VGA, and a Component adapter. I have a dual-layered DVD, eventhough I do more creative stuff on my other Computer. I have an Sata 150 on the board, with 1 465GiB Samsung HD, used for Linux openSuSe 11.1 and a Western Digital used for Windows XP Pro. I get HD OTA, but I am on the wrong side of the condo to get the other stations. I get ABC, FOX and the local PBS and another station that is local that shows Andy Griffin, Dr. Phil, Oprah at night and those Judge shows during the day. The HD is really clear. I am working on my remote problem like you. Then I can set at my desk connect to this box and stream a movie to my office. My roomate can do the same with her laptops if she needed. And if the “little people” come to visit, they can watch something on a laptop at the table or in the big chair. I problably will build another PC/PVR or hack the other Directv that’s in the living room. It gives me something to do. I keep busy with this stuff along with NASA, and other stuff. I am a amateur photographer. I thought about moving to a DSLR but my body doesen’t let me get about much, so I just tinker. I have lots of stuff I want to do. Like I read you story about animation. I have stories I would like to like that with my little people. They do funny things and it would be great. When I run Linux or Windows, this processor waits for nothing!!!.. and it is running a wireless AP box to my router at my office desk. This machine is in my Master BR and is attached to a 27″ Olevia monitor that has 1 of all the connections and 2 10w speakers. Sometimes when I watching through my eyelids, I hear sound like I’m in the theatre…bouncing off the back wall. It’s pretty cool. Give openSuSe a chance. If you have the repositories all set, then you are ok with what you would need. Have a great day. Didn’t mean to comment this much. Along with the whole thing which appears to be building within this particular subject material, a significant percentage of opinions are actually fairly exciting. Even so, I am sorry, because I can not give credence to your whole strategy, all be it stimulating none the less. It looks to everyone that your comments are not totally validated and in actuality you are your self not really totally certain of the assertion. In any event I did enjoy reading it.